Returning home to CHURCHs | America loves Sporks! Wilkinson Boulevard used to be the old road to the airport – and everything that meant – stripper bars, rent by the hour prostitution motels, pawn shops, used tire stores. For the first few weeks until I got my first paycheck (I was that broke after the college drained me), I lived in a former Howard Johnson’s motel that had been turned into senior housing, kind of. I was told it was infamous as the place the Outlaw Motorcycle Gang used to hang out. Have I painted enough of a picture? 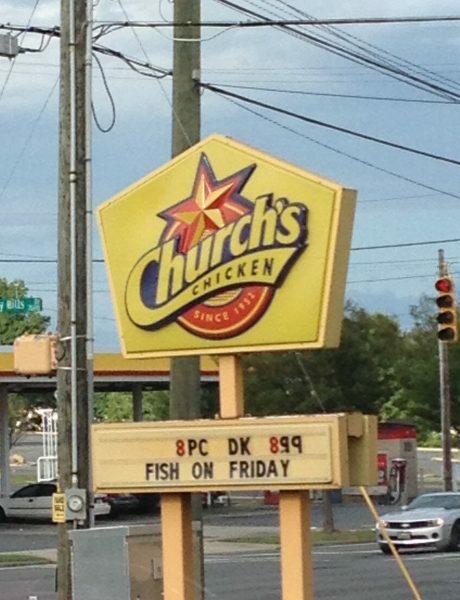 Church’s chicken has a long and glorious history. Haiti has mentioned it once or twice. It was started by black folks for black folks. Probably around 1979, I ate at the Church’s chicken on Wilkinson Boulevarf a few times. Getting back there has been on my Charlotte bucket list. This area of Charlotte is definitely “the wrong side of the tracks”. A White person going in is going to create a murmur. Either I’m lost or I’m an undercover policeman. I’m obviously not the latter. So the last time I was here was memorable enough to remember the details 36 years later. There was something wrong with the order – like I ordered dark meat and got a wing. When I went to the counter, I was greeted with “whatsdamattawidyou?”. Now that’s customer service! I figure enough time has passed to give it another chance. I did a double clutch in the parking lot – there was a Hispanic looking guy hanging out of a pickup truck door talking on his cell phone. I’ve learned not to second guess my instincts, especially when carrying an iPad. I ditched the iPad and went in. On the way, I said Hi to a friendly rotund black man heading to his car. Up on the curb was a very old black man who wanted to engage me in conversation. That’s why I was here. If you’ve been around, he’s a very familiar type of person. He rides a bicycle and at least in his 80s with leathery wrinkled very dark skin. My guess is he probably gets by collecting aluminum cans (NC has no bottle deposit law). As close as I could count, he had one tooth. He was curious how old I was, so I asked him how old I look – his answer was “80”. I said that’s pretty close and how old I feel at times. He suggested I need to get out more. He’s absolutely right. My opinion of Church’s didn’t improve much. The cashier made an obvious boneheaded mistake. I don’t think there was any malice, just inexperience. I ordered a Big Tex chicken sandwich, fries and Mac & Cheese. Only after they made the sandwich and scooped out the Mac & Cheese did she realize there were no fries cooked. It wasn’t a case of someone else bought them. She just hadn’t looked. The sandwich was pretty bad – I threw about half of it away. “Texas toast” is supposed to have Butter or at least margarine. Fries came complete with four pieces of okra. Ask your nanny if you don’t know what okra is. Mac & Cheese was Okay. I was cured of eating fried chicken by working one summer at KFC where we could eat what we wanted for free. Was this fried chicken? I have not set foot in a Church’s, so I have no idea. I have been in a KFC about 3 times in my life, so that is my experience base. Fried chicken is their main thing, but not what I got. The Big Tex is two chicken tenders between two pieces of Unheated Texas Toast with mayo, lettuce, tomato and pickle. The fries are basically what you can buy at Walmart. Pre cooked frozen crinkle cuts that you are basically just warming up. The Coca Cola was great, though! Memories… Churches Fried Chicken was started in TX before KFC. I loved their chicken. You could almost find a CFC every couple of corners in San Antonio. Unfortunately, their service has always slacked. Managed primarily by people who could not get a job anywhere else, CFC succeeded simply by their flavor, freshness, and accessibility. The employees were always acting as if you interrupted their life when you walked into the store, which again was typically of the people they hired. Hey Fred… had a little problem in login today. After reading your blog I came back and added your site to my cookies exemptions and it seemed to work. If you can go ahead and delete the new acct JayMar2 and attach my email to this account. I don’t recall the email used in JayMar anymore. Thanks. Was concerned that I might blocked out of one of my favorite sites. Suggestion have a way to contact you when unable to login. Again thanks.